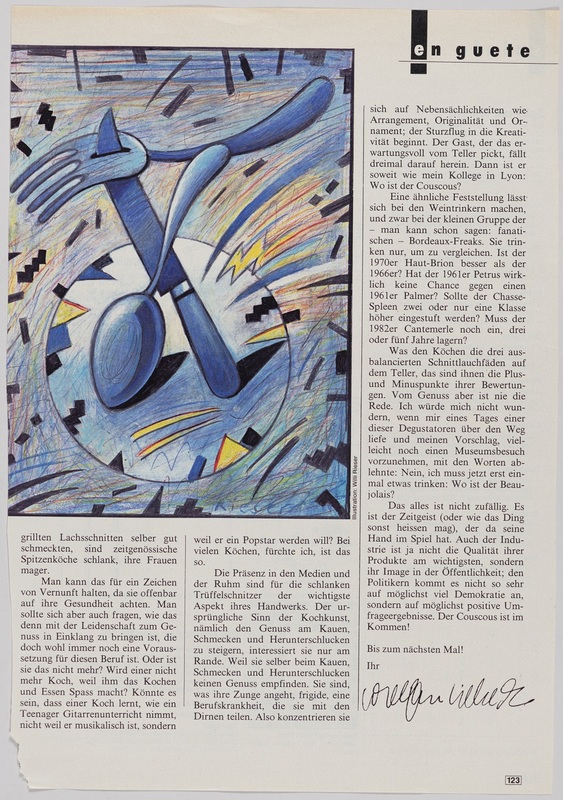 On the two-page spread on the theme of “fork lunch” in Willi Rieser’s draft for a humorous cookbook with the title “Kitchen’s Kitsch King” there is a bitter struggle between knife, fork and spoon. 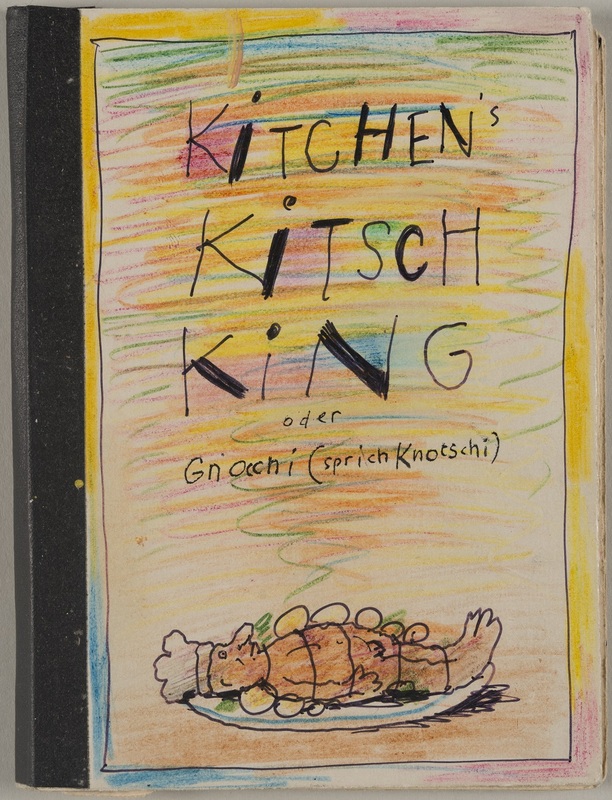 On the draft of the cover for a “Koch & Essbuch” [Cookbook & Dining Guide] a fork is pictured stabbing the other two. The cookbooks were planned for 1978, but never came to fruition. The sketches and drafts stored in the collection of graphic arts at the Swiss National Museum are therefore all the more precious. 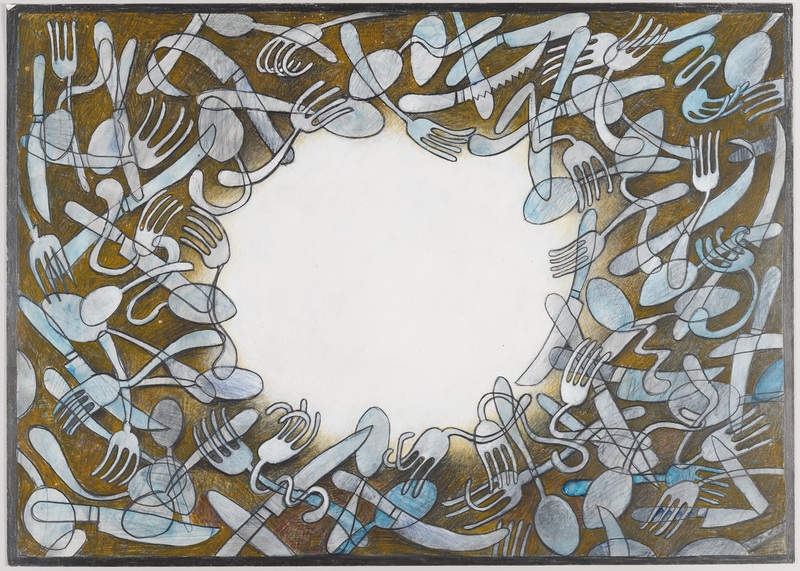 Two small-format publisher’s dummies with drawings and large-format painted drafts for individual pages are some of the most original works on the journey to book art, which Willi Rieser focused on in the last ten years of his life. He died one year ago today at the age of 80. 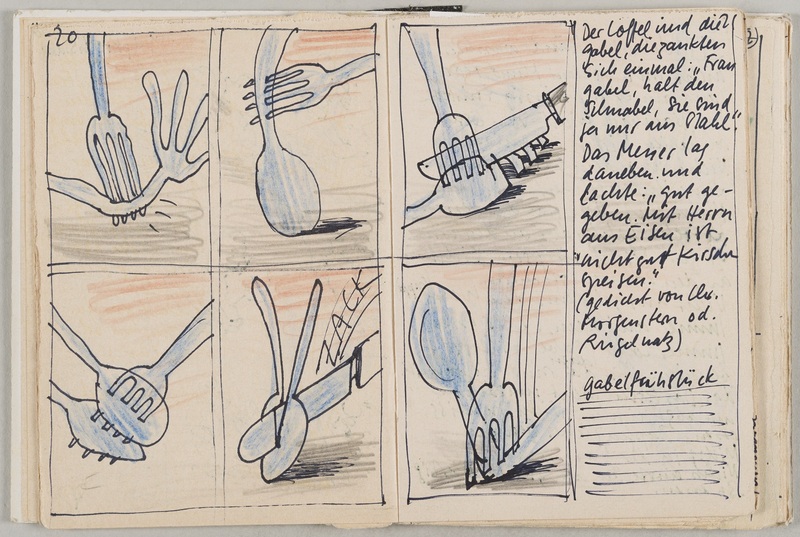 Cutlery represents a key motif in Willi Rieser’s work. He got the idea for the graphic and artistic realisation of this theme from the poem “Herr Löffel und Frau Gabel” [Mr. Spoon and Mrs. 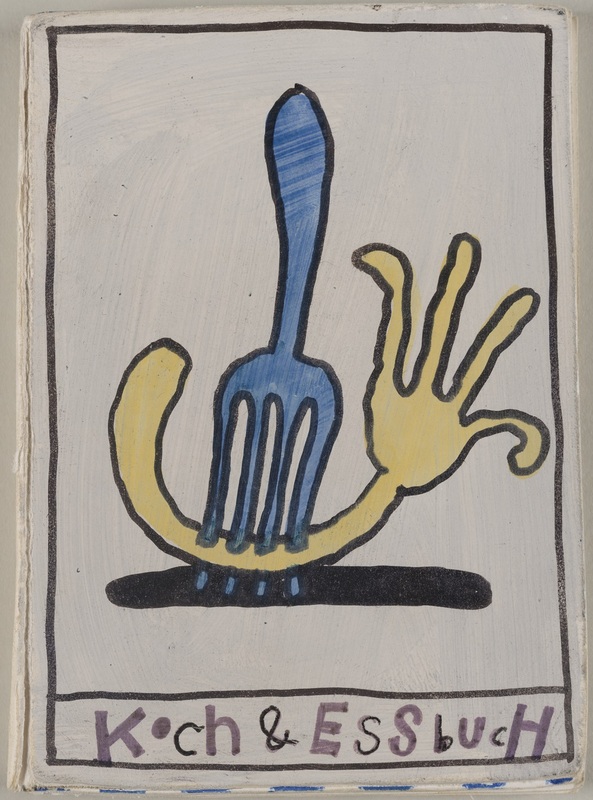 Fork] by Christian Morgenstern (translated into English by Max Knight): “Mrs. Fork and Mr. Spoon had a fight one afternoon. 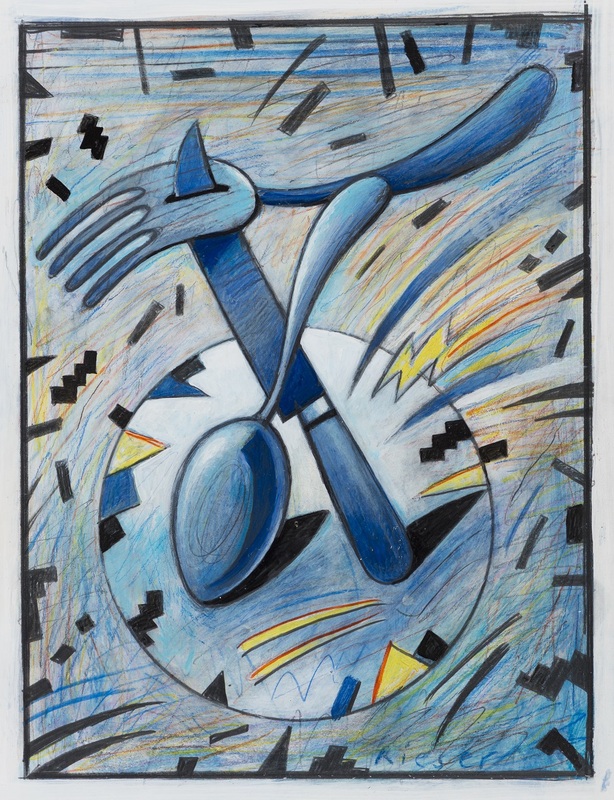 Mr. Spoon began the scrap, and he told her: ‘Shut your trap!’” This merry humour, but one which can also be sharp and cutting, combines with a strong feel for the quirky side of people, animals and things – these are all characteristics of the social outsider Willi Rieser. 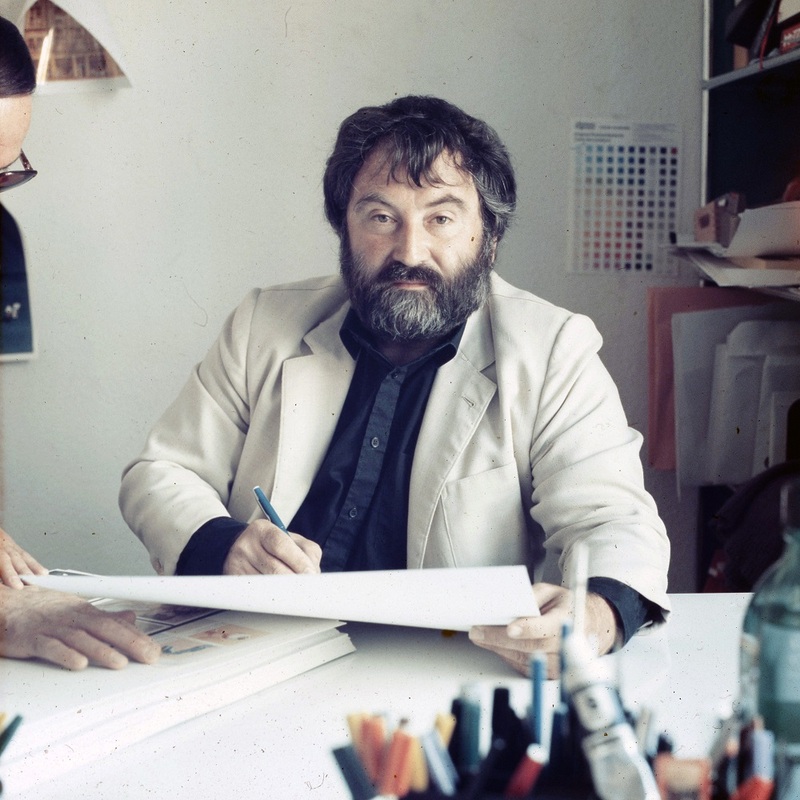 Humour, good cheer and conviviality, both figuratively and literally, are striking personality traits of this graphic designer, who after abandoning a pharmacist apprenticeship in St. Gallen embarked on an apprenticeship in graphic design at Alwin Kneubühler’s studio in Zurich which, as he notes with relief in his handwritten autobiography, he successfully completed at the studio of Paul Leber and Charlotte Schmid. At the School of Arts and Crafts he was in the same class as Armin Vogt and Rosmarie Tissi. 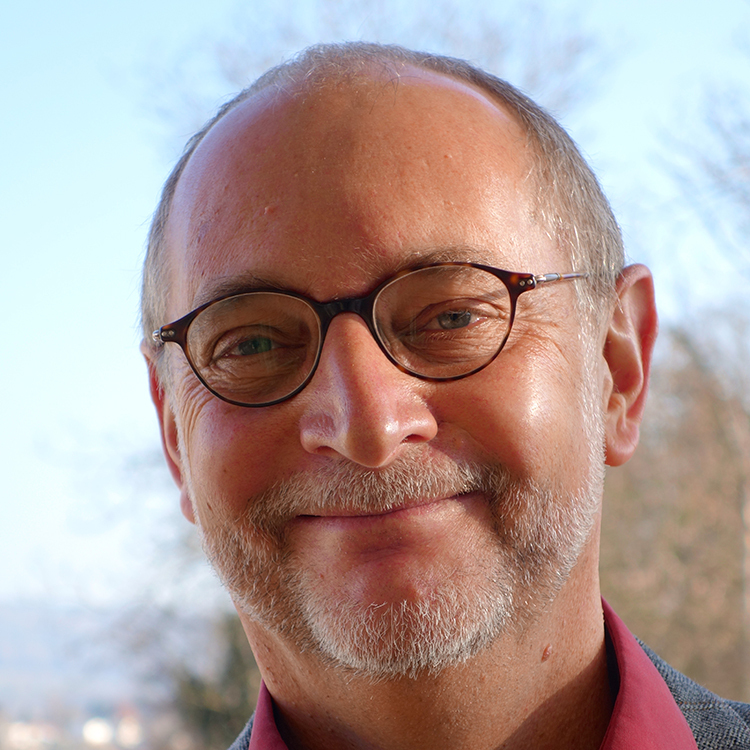 Armin Vogt recalls: “Willi sat on my left during the final exam. We had been set the task of designing a box of cigars. A few sketches first, in pencil, then the coloured draft. Willi sat down and painted the draft straightaway. Then, for appearance’s sake he drew a few sketches and left the room an hour before the others.” His former classmates describe him as a confident, spontaneous, humorous and amiable person. He kept Rosmarie Tissi entertained with his pranks and jokes during lessons in accounting. 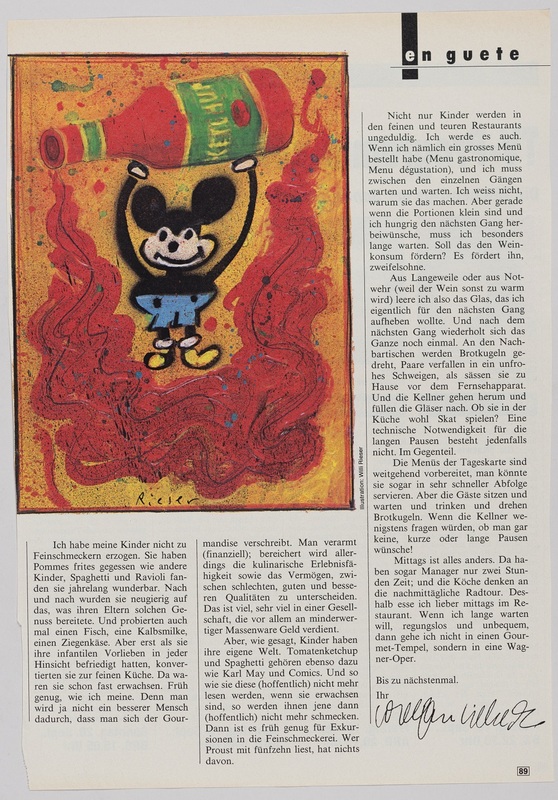 Willi Rieser was born to be a painter. 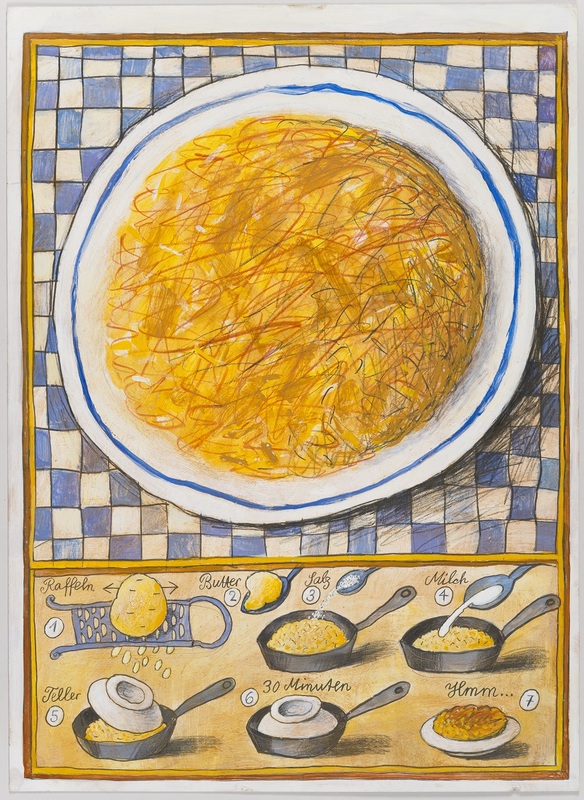 So much so that he once received a temporary ban on painting as a child because he had painted a large area of the floral wallpaper in his parents’ bedroom using “eyebrow pencil and lipstick, nail varnish and rouge”. “A bold composition. Powerfully jotted areas of colour, with black streaks driven through them.” A friend of his mother was impressed by the boy’s work, and she showed it to a painter, who said: “Wow, what a talent, if he carries on like that he’ll go far!” The painter, as Rieser writes in his handwritten autobiography, was Cuno Amiet. 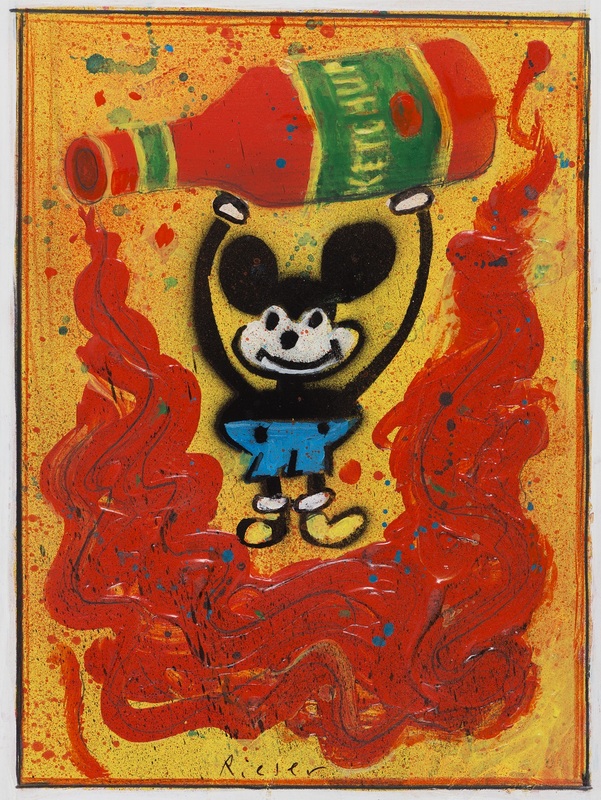 The hand of the painter and caricaturist also dominates Willi Rieser’s posters as a commercial artist. Five have been decorated as “Best Swiss Posters of the Year” by a jury appointed by the Federal Department of Home Affairs (FDHA). Willi Rieser was commissioned by Advico AG in Gockhausen to design a poster for Sinalco. Three years later he became one of the founders of the Art Directors Club Switzerland. 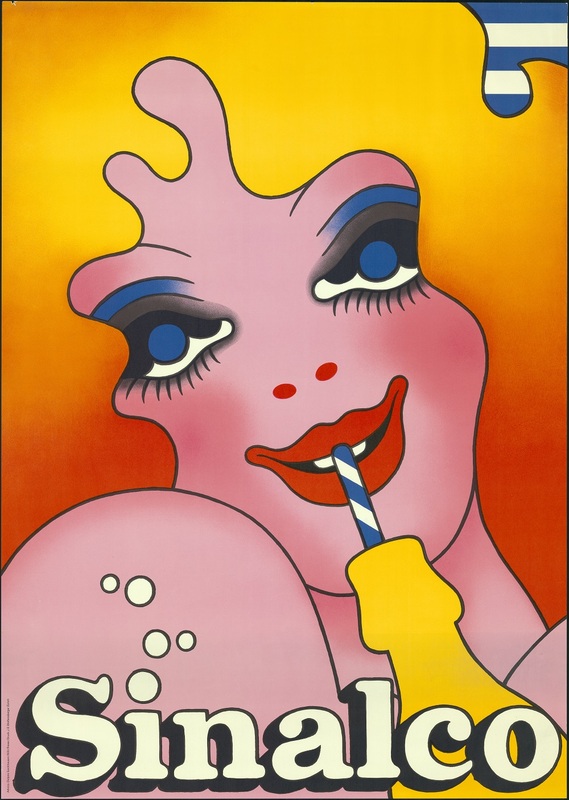 He soon became one of the most sought-after illustrators in Switzerland.